Music streaming App Spotify offers free, unlimited random play on Windows Phone. The field of ​​streaming music progresses. Companies are increasingly likely to start. If they are still struggling to earn income, they must appeal to consumers and combat competition. Deezer and Spotify leaders extend from several months of free offers. 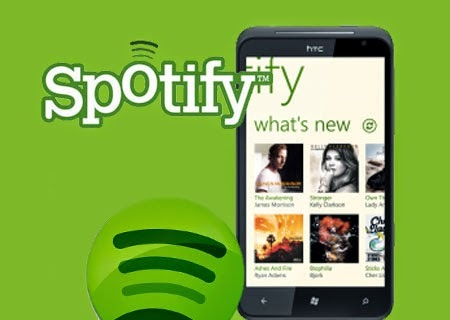 Spotify is now interested in Windows Phone smartphones. Version 4.0 of the mobile application can now enjoy the random play free and unlimited. Conversely, advertisements are inserted during playback. Moreover, the update brings improvements related to suggestions that the tastes of users and simplifies the search titles. The update (9 MB) is being deployed since August 26 on the Windows Phone Store and is available to owners of smartphones running Windows Phone 8.1 and Windows Phone 8. This update with random free listening followed those proposed it a few months ago on PC, Android and iOS. Spotify has changed its strategy by offering a free offer with advertising and a more complete premium offering with a monthly subscription of 9.99 dollars. Since Deezer followed by offering the same models for tenders. The companies hope that new users will discover their music streaming services and choose then a paid subscription. It remains to be seen if the premium offerings of attract consumers that companies can remove enough revenue.